If you are short of time, the answers to the following 3 questions should let you know all you need to about the Oral-B 9600. If we have missed something, let us know in the comments. If you want more detail, you can read our full Oral-B Genius 9600 review further down the page. It is a premium electric toothbrush that offers all the essential features you need and want, plus a whole lot more. The cleaning performance is fantastic, the Bluetooth technology is innovative and the premium travel case reflective of the price asked for this toothbrush. Aside from a couple of differences in the accessories included in the box and the brush handle color options, the 9600 is identical to the Genius Pro 8000. Having been on the market for longer, the 8000 is generally a little cheaper to buy, which for us makes this our choice of electric toothbrush. If you particularly want the Sakura Pink color option, you will need to go for the 9600. To clear up any confusion, we compare the two US models against one another, and against their European equivalents, in our Genius comparison post. We run through some more buying options in our roundup of the best electric toothbrushes. 3. Where is the best place to buy the Genius 9600? A wide variety of stores sell Oral-B electric toothbrushes but fewer stock this premium Genius 9600 model. Typically we recommend Amazon because it is very competitive on price (cheapest at time of review) and often has special offers running more frequently than others. They also offers free delivery. Nonetheless it is always worth checking out other retailers as well – we have included a live price comparison below, and it’s always worth checking out eBay. Launched in late 2018, the 9600 arrives about 2 years after the Genius Pro 8000 was launched. The model number may have you thinking that the 9600 is the more premium of the 2 brushes. It is not quite the case. As you can see these are small differences, none of which are deal breakers in my opinion. The 9600 is essentially identical to the Genius Pro 8000. At the time of writing there are several variants of the Genius 9600. The difference between each of these variants is the color of the brush handle and the color and pattern on the smart travel case. Technically, the brushes are identical as is the box contents. Therefore, selecting between each variant is really a case of color preference. In the case of the Black colored 9600, the brush handle is completely Black, but the provided brush heads are White in color. With all other color options, the handle is primarily White in color, but the panel running down the front of the handle has is the colored part. Here are what I consider to be the pros and cons of the Oral-B 9600. Battery life – It offers up to 2 weeks of use between charges, which is better than the 7 days offered by some cheaper models. Design – A smart looking brush that feels good in hand and is available in a range of colors. Cleaning modes – With 6 cleaning modes there is lots of choice to suit all different user needs. Pressure sensor – The LED SmartRing shines Red to alert you when you are brushing too hard, stopping you from doing unnecessary damage to your teeth and gums. Smart travel case – A premium travel case for a premium brush. Not a cheap plastic case, one that looks and feels great and can charge your brush and smartphone too. Bluetooth connectivity & Oral-B app – Making the most of technology to monitor your cleaning progress, educate and achieve improvements in technique and your oral health. Bluetooth connectivity & Oral-B app – Clever as it is, it requires changing habits that many of us have formed over many years. The position detection is a bit flakey and takes practice to master. Proprietary connector – The travel case and charging stand uses a proprietary mains adapter rather than a more universal and readily available option like micro USB. Thus you need to take this with you too when travelling. From the moment you set eyes on and handle the 9600, it is clear that this is a well designed and premium electric toothbrush. Solid in hand the brush is 9.4 inches tall and around 1.25 inches wide and deep and weighs in at 4.9oz. The rounded design is a little larger than the likes of the Pro 1000 or 3000 models but that is to accommodate some of the extra benefits this offers. Sonicare have always had the edge for design and built quality and ultimately I think they still do, but the Genius is very close and in fact has some touches which make it better. One of the nice touches is that the back of the brush handle has a rubber grip rather than smooth touch plastic. Yes, it can be argued it detracts from the design, but it helps keep a firm hold of the brush, even when wet, which I think is most important. Where some brushes are quite minimal in design, there is a little more going on with the 9600. Of course for weight, durability and practicality, the body is made of plastic and a break in this on the front of the handle makes way for a tall, essentially rounded rectangle shaped panel. It is this panel that depicts the color of the brush handle. You will see in the hands on photos it is a Rose Gold panel, but the 9600 is available in a range of colors. Choose the Orchid Purple and this panel will be Purple in color. Within this is a similarly shaped yet smaller rubber panel in the upper third that has the power button and cleaning mode button. Below this are icons for the different cleaning modes, well 5 of the 6 available anyway. Daily Clean, the default and go to cleaning mode has no icon. Why?! It is just odd and confusing as it looks like there are only 5 cleaning modes not the available 6. Each icon, will be lit up White when the brush is turned on. A small oversight in my opinion, is not being able to change the cleaning mode until the brush is switched on. Once a mode has been set, if the brush will start in that same mode next time, you just need to turn it on to change the mode. The icons also make it slightly more difficult to know which mode is which. You can learn these, but the name of the mode would be easier. The handle is sealed shut, because the lithium-ion battery and electronics are inside. The battery is not user replaceable. This sealing also stops the water getting in and keeps the brush water resistant. Stand upright on the base the brush will do, but there is too a recess into which the prong on the charging stand fits to charge the brush. Moving up towards the top of the brush, on the neck is where you find the LED SmartRing. The SmartRing is a customizable light panel that can be set 1 of 12 colors from within the smartphone app. The SmartRing also doubles up as the pressure sensor and this will illuminate Red when the pressure sensor in the brush is activated. Bristles of the brush need only skim the surfaces of the teeth. The pressure sensor alerts you when this is not the case. Scrubbing with a toothbrush, does not equal a better clean. When activated, the brush will automatically reduce the speed the brush head moves at and stop the pulsation until the pressure is reduced. If using all the features of the brush, when activated you will get what is known as triple detection. There is the pressure sensor light, the sound of the motor and the message within the app to tell you to change that brushing approach. Above the SmartRing is the metal shaft that feeds into the brush motor and the brush heads connect to. Oral-B brush heads are fully interchangeable and slide on and off the top of the handle. In the box with the 9600 you get 1 x CrossAction, 1 x Sensi UltraThin and 1 x 3D White brush head. These are 3 of 6 different styles of heads Oral-B offer. Each offer different benefits, as explained in our guide to Oral-B brush heads, but the CrossAction and Sensi UltraThin are the best heads to use. Any head can be used on any Oral-B brush and on any cleaning mode. But, technically you may get better results with a 3D White brush head on the Whitening cleaning mode. That said, do not get too hooked up on this. You will get better results from focusing on brushing twice a day for 2 minutes with the right technique than using a particular brush head on a particular cleaning mode. If you were not already aware, Oral-B have small round brush heads and these are very effective when it comes to everyday cleaning. Small and compact you can generally get the brush head into all the hard to reach areas of the mouth. The brush heads provided with the Genius 9600, use an oscillating rotating and pulsating motion as shown in the following animated image. Remember to replace your brush head at least once every 3 months or 90 days if not sooner. Typically the cleaning modes last for 2 minutes each and this ties in with dentist recommendations. There is a built in timer which has 2 modes, the standard 2 minute or professional. With the professional mode (came preset out of the box) the quadpacer on the 9600 kicks in. So then, to one of the big differentiating factors about this toothbrush, is the Bluetooth connectivity. Bluetooth connectivity has been around for a while, but over the last couple of years it has evolved to be more reliable and more useful. 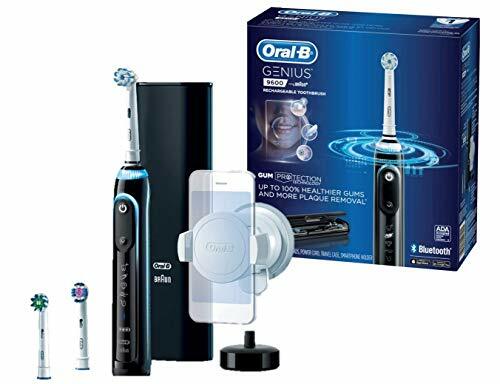 The 9600 pairs with an Android or iOS device and will communicate with the Oral-B app that you download from the relevant app store. Not too much has changed in the app and how it works in comparison to other Bluetooth enabled models like the Genius Pro 8000. Oral-B promote that the 9600 has ‘Gum Guard’ or ‘Gum Protection Technology’, in a way that makes it sound like it is not available on other brushes. The reality is though, this is actually a feature of the app and is available to other brushes aside from the 9600, they just don’t make this very clear. So, Genius Pro 8000 owners, you can get this Gum Guard by upgrading to the latest version of the app, if you have not done so already. Essentially Gum Guard is a special brushing journey, specifically designed to help improve your gum health over an 8 week period. You run through a series of screens, shown below that collect data and allow you or your dental professional to make custom adjustments to help achieve the end goal. For those not familiar with the Bluetooth connectivity on an Oral-B brush, let me run through some of the main features. The main idea of the app is that it communicates with the brush handle, monitors and educates you to achieve better oral health. It is a little like having a dentist looking over your shoulder giving you the helpful nudge and guidance to do better. At the core is the built in timer and clean tracker. It shows on screen a timer as you brush, alerts you if brushing too hard and generally keeps you on track. Some get distracted and bored when brushing, the app integrates with your calendar so you can see your days agenda, news, tips and tricks, so you stay interested when cleaning your teeth. Although for me, on occasions it can be a bit distracting from you ensuring you brush correctly and you may want to customise the settings to avoid some notifications. A much promoted feature it the Position Detection Technology which uses the smartphone’s camera, to track and then show on screen visually where you have and have not cleaned. Anyone of any age can use and learn from the feedback it gives. Whilst a toothbrush plays a vital role in oral hygiene the routine and way in which you clean does too. This app makes it easier to see and represent in real time just how good, or bad you are doing. All of this data is logged in the app for you to refer back to. Perhaps even show your dentist to prove you have been brushing. The app is deeper and more intelligent too. You can customise the brush and personal goals through the app gaining more suitable tips and advice along with product suggestions. For example, if you wish to whiten your teeth the app will advise and amend your routine to achieve the goal. You can choose from the Fresh Breath Gum Health, Plaque Fighter, Whitening and Ortho Care journeys. Online backup is another feature. With an Oral-B account you can never lose data. The Bluetooth connection on the whole was reliable, but at times it can be a bit fussy. To get the most from the position detection, you have to hold your smartphone still and stand right in front of the camera. This is where the smartphone holder comes in to help. Provided in the box, it is white in color, no matter what color your brush is. It is essentially a smartphone holder you would use in a car and attach to the windshield. The idea is you stick it to the bathroom mirror or in some cases wall tiles. Do make sure it is secure before mounting your phone! There is a lever to lock it in place and unlock the hold along with a tab on the suction cup to further release the holder. The design is universal with clamp arms that fit many smartphones of varying sizes from 58mm wide through to 83mm wide. There is then a full 360 degree rotation option. It makes sense, but I do question how many people want a suction cup holder on their bathroom mirror, particularly when it tends to have to be placed in the middle to line up with your head. Even for me, even as someone writing about toothbrushes, despite having used this many times over the last couple of years I struggle to fit or integrate this into my daily routine. This is in part because it feels a bit clunky and it takes a few seconds, maybe 15-30 each time to get setup and begin brushing. You need to have your phone, make sure it is positioned correctly and then stand almost statue still so the phone keeps track. The idea is right, the implementation is not perfect. Extra silly quirks include the smartphone holder having full tilt and swivel capabilities, but the phone must be perfectly upright for the position detection to track, making the holder mobility almost redundant. Ultimately it is clever and worth persisting with until you know you have perfected your routine. Once you have you can dip in again every few weeks just to make sure. For most, daily use of this setup is just a bit cumbersome. This said, Oral-B have tried to innovate here for the right reasons. Their studies have shown that up to 80% of people spend insufficient time brushing in at least one zone of their mouth and 60% of people either didn’t brush their back molars at all, or spent insufficient time brushing them, so you can see why the position detection technology exists. In Oral-B’s defence, there are added extras to the app, like the ability to get reminders of when brush heads need replacing and a ‘Fun Zone’ to make brushing a bit less of a chore. To conclude with the app, it is also worth noting, whilst it is perfectly possible to share a brush handle, the handle can not differentiate between 2 users, so your data synced to the app will be wrong. If multiple people in a house want to track and log their data, you need a brush handle for each user. You might think all these smart features will drain the built in battery. Whilst they have some impact, you will get 2 weeks life from the brush between charges. The brush can be charged via 1 of 2 means. The main method is with the included charging stand. A rounded unit it is about twice the width and depth of the handle itself, with a prong on the top that the brush sits on. It is rounded in its design and on the side is a power connector, into which the provided plug adapter fits. This is a new design of charging stand with a detachable power cord. Most other brushes have a power cord hard wired into the stand. I like this approach, but it is a proprietary power adapter and not a more universal USB standard. This same power adapter works with the travel case I will mention in a moment. It has a 2 pin US power plug configuration, but supports 100-240v, so you can take it with you internationally, you may just need a plug adapter depending on where you travel to. I am not sure if I am being too picky or not, but traditionally the power cable fits into the back of the stand, so when looking at the stand, the brush faces you head on and the cable leads out directly behind the brush. With the 9600, the cable feeds out to the side, so when placed on a countertop, if you face the brush towards you the power cable feeds out to the left or right side. It looks a little odd in my opinion. It is perfectly safe to leave the brush on the charging stand and connected to the power, the brush will stop accepting charge when it is full. If you don’t keep the brush topped up, when the brush requires a charge the last battery bar within the on the lower third of the brush handle will flash red. The travel case included with the Genius Pro 9600 is branded and can be considered smart. Rather than a cheap yet functional piece of moulded plastic, the travel case here is much more capable. It is a fairly large case, but solid and made from nice quality materials, it holds the brush handle and 2 brush heads. It hinges on the left side and on the right is a large plastic release button to open it up. At either end of the case are gloss plastic panels with the bottom of the case being home to the power connector, USB port and charge light. This is where the provided power adapter fits. If you need to charge your brush on the go, you can do so whilst it is in the case, but you need to connect the power adapter to the mains, there is no battery built into the case. It uses the 1 and only power adapter that comes with the 9600. If you use this for your charging stand at home, you need to remember to take it with you when travelling. The USB port allows you to connect a USB device, like a smartphone to it, so you can not only charge the brush but your phone to. If we were to get critical this isn’t a great way to charge your phone up fast, but ideal for overnight charging. There is even a smartphone holder built into the case, that will hold phones up to 12mm thick. It would have also been great if the case used a more standard Micro USB charger, rather than a proprietary connector. This would mean that if you misplaced your Oral-B power adapter it would be easy to find an alternative. Sonicare have got this bit right! The 9600 is not absolutely perfect in my opinion, but I have yet to find a toothbrush that is. No brush will suit everyone. I am being very fussy because at this price you kind of need to be. Ultimately the 9600 does the job of cleaning the teeth really well, heck it even has the approval of the American Dental association, so something is right. It is just some of the other extra features that could be improved upon. My biggest concern is that the very technology that is supposed to improve your oral health, is the same technology that makes doing so more difficult than it needs to be. A degree of personal determination and commitment is required. The importance of battery life varies from one person to another. If you are generally always brushing your teeth in the same place, a short battery life is likely acceptable. However, if you travel frequently for work or personal reasons, then you might want a toothbrush that will last longer between charges, so you don’t have to worry about constantly having to recharge it. The Genius 9600 offers 2 weeks battery life or to put it another way, a maximum of 56 minutes of brushing time. This 2 weeks is based on using the standard Daily Clean mode. The longer cleaning modes such as Pro Clean will cause the battery life to be shorter. At 2 weeks, the battery life of the 9600 is better than some of the cheaper models form Oral-B such as the Pro 1000. However, it falls short of Sonicare models that typically offer much more than 2 weeks. Therefore whilst it is not the best battery life, it is certainly more than acceptable. If it wasn’t clear, the battery is built in and cannot be removed or replaced by you. It is a lithium-ion battery that the brush uses, which is the newest standard for reliability and performance. The 9600 comes with 2 ways of charging the brush. One is the more traditional charging stand whilst the other is by using the travel case. The charging stand provided is a new style and design to those commonly seen with Oral-B brush handles. The brush still sits upright on the stand, but it is a little bit smaller and has a detachable power cable rather than a hardwired power cable that is common. In the box is a single US power adapter. It is this that connects to the charging stand or the travel case to charge the 9600. The power adapter is rated for 100-240v which means it can be used internationally, you just might need a plug adapter if using it outside the USA or Canada. I like the fact that the power cable is shared, it means power cable is used more efficiently and Oral-B cut down on the amount of cable they use to produce such products. Sadly, I don’t think it has affected the price. The charging dock itself is white in colour and has a small prong on the top which aligns with a recess in the bottom of the brush handle and will charge the brush fully in about 8-12 hours. I tend to leave it on charge overnight. When charging the battery charging icon pulses with a White light. For those who might be concerned, it is fine to leave the brush on the charging stand and connected to power. It cannot overcharge, electrical circuits inside stop this. You will never know quite how much power is left, is it 20%, 15%, the lights are not that accurate and I would have thought more feedback could have been given through the app, but sadly not. The travel case works well for those on the go and by connecting the power cable to the case, you can charge the brush whilst inside. Slightly frustratingly it is a proprietary charger, so you have to remember to take that with you. There is no battery in the case, it has to be connected to the mains to actually charge the brush. You will find USB port on the case too. You can connect a USB cable to this, to charge items like your phone. So when travelling you take the charger for the case and just the USB cable for your smartphone and from just one socket you can now charge 2 items. Personally I would have preferred it if the charging case itself used a more standard connector like microUSB or USB Type-C. Even better, would be if the case could charge via a USB port on a computer like Sonicare DiamondClean Smart models do, but maybe I am being a bit picky. As I have already made clear, the Genius 9600 is a premium electric toothbrush, so naturally with a premium product comes a premium price tag. The suggested selling price for the 9600 is $299. Please do not pay this! Many brushes often actually sell at a discounted rate, to make the actual selling price look much better. It differs between brands and models, but this can be anything form 10-50%, but typically around the 20-30% is most common. Within days of launch the 9600 is retailing at 30% less, at $180 — we have included a live price comparison here. This doesn’t just apply to Amazon, Walmart are selling at this price too. At $180, whilst this is not cheap, it is a much more appropriate and comparable price to similarly featured brushes. Given that it is new, it will also command a small premium. As the time passes, expect to see another $20 or so come off the price, but the majority of the discount has already happened. Subject to the time of year, you may also see promotions such as mail in rebates to save a few extra dollars. Replacement heads can be purchased in packs of 2, 3, 4 and 5. The prices vary but are on average around $6-$8 per brush head included. The pack of 3 heads often works out cheapest at about $18-20 per pack. Using the average cost (based on one user) and ownership over 3 years, the Genius 9600 will cost $257 or just $0.23 per day to own. If purchased at the full $299 price you would be looking at $376 or $0.34 per day to own. If you share the brush handle (changing the heads of course) with another user, this will help bring the cost down, but in this instance, the Bluetooth pairing tracking is compromised. I cannot conclude this section without making mention of the Genius Pro 8000. It has been on the market longer, but they are essentially identical. The time has allowed the price to settle. Although always subject to change, as any price is, the typical selling price is $150. Over the same 3 year period, this comes out at $227 or $0.21 per day. It is not a huge saving, but it’s another $30 in your pocket and you get a better box contents in my opinion. We would all love the products we buy to last forever, but a fact of life is that this is rarely the case. The very nature of being an electronic item with moving parts does indeed make the brush susceptible to failure. However, the reliability of Oral-B products tend to be very good. The 9600 comes with a standard 2 year warranty from Oral-B that covers typical faults that are not as a result of user damage. Generally we find the average life of an electric toothbrush is 3-5 years, but many last longer. The 9600 is as we have established the same as the Genius Pro 8000 and I have been using this daily for the last 2 and a half years without issue. When based on existing, tried and tested designs, there is a greater chance for reliability. Having used and handled it for a few weeks, nothing gives me any cause for concern and don’t doubt it will serve you well. The Genius 9600 is a fantastic toothbrush. I make no reservations in saying that it offers more in terms of cleaning modes and other features than most people need or want. However, if you desire the very best electric toothbrush than this is certainly up with them and serve you well. Is it absolutely perfect, no, but no brush ever is. I think there is scope for improvement. My biggest frustration is the travel case, Sonicare do a much better job in this regard and the position detection is a hassle to setup and use as well. For the most part these complaints are just me being picky. If upon reading this review, you think this brush is the one you want, I won’t stop you going for the 9600, but I urge you to look at the Genius Pro 8000. Why the 8000? Technically it is the same toothbrush, with in my opinion a better box contents and it normally costs less, leaving you with more money in your wallet. Is the Oral-B 9600 an oscillating brush? No, the Genius 9600 has 6 cleaning modes. No other brushes offer more. The brush heads that are supplied with the 9600 are 1 x CrossAction, 1 x 3D White and 1 x Sensi UltraThin. You can change the head with any others on offer from Oral-B. There are many that work with the brush handle. There are 6 main brush head options that include Cross Action, Floss Action, 3D White, Sensi UltraThin, Precision Clean and DeepSweep. Does the Genius 9600 have a pressure sensor? Does the Genius 9600 have Bluetooth? Does the Genius 9600 come with a warranty & how long is it? If purchased new from an approved retailer the brush will come with a 2 year warranty. Does the Genius 9600 have a built in timer? Yes. Often referred to as the quadpacer; subject to the cleaning mode the brush will provide an audible warning through a slight pause in the brushing mode to tell you to change quadrants. There are 4 quadrants to the mouth, and brushing is normally for 2 minutes. The timer will active at 30 second intervals, with a different sound at the end of the 2 minutes. There is no visual timer included, although you can see the pause in the brushing mode if watching the brush head itself. Depending on the mode selected, the time of the clean and the quadrant cleaning times may well be different. The battery lasts up to 56 minutes, which if used on the standard daily clean mode is 14 days based on 2 cleans per day. No, a wireless smart guide is not included. Yes. The 9600 is charged via 2 different methods, each of which use the provided 2 pin power adapter. You have a charging stand and a premium travel case. The brush sits on the stand and lays within the case and will charge when the detachable power cable is connected. Can I use the Genius 9600 in the shower? Yes. The Genius 9600 is water resistant so if you choose you can use it in the shower. Avoid submerging it in water. Yes, travel case is included in the box. Do you own or have you used the Oral-B 9600? I live in Canada and the 9600 is on sale for $150 Canadian compared to $180 for the 8000. Do you recommend buying the 9600 at that price? That is a good price for the 9600 and I would suggest the better buy. Just be aware, that the most useful accessory that will be missing with the 9600 is the brush head storage compartment. This is provided with the 8000. If that is not important to you, then go ahead, get the 9600.